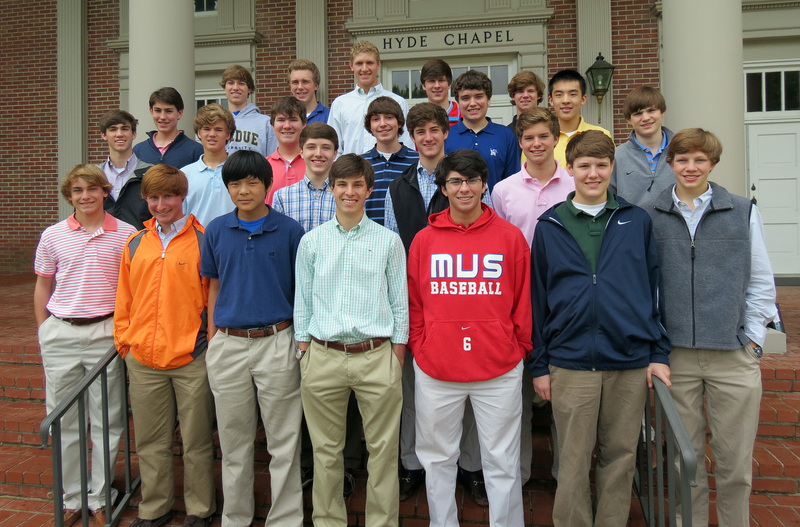 The 2013-14 student ambassadors are (front row, from left) Griffin Wilson, Max Meyer, Yunhua Zhao, Hays Moreland, Connor Wright, Zack Whicker, and Alex Carruthers; (second row) Jeff Guenther, Pierce Rose, Townsend Warren, Michael Reddoch, Sherman Tabor, and Will Farnsworth; (third row) Ted Helmhout, Zach Walker, Hayden Meacham, Brad Jarratt, and Richard Ouyang; (back row) Ty Wolf, Jack Gray, Preston White, Jack Christenbury, and Tom Garrott. Student ambassadors are chosen in the spring of the sophomore year for a two-year commitment to represent MUS to school guests, visitors, alumni, and friends. They participate in admissions, development, and alumni programs throughout the year, in addition to serving as hosts and tour guides.